When Eden was diagnosed with a form of cancer no one had ever seen before, her family knew they needed Texas Children's. Shannon knew her 10-year-old daughter, Eden, was strong. Even as a three-pound preemie born more than two months early, she was a fighter. But Shannon could never have foreseen the terrible illness that would demand every bit of Eden’s resilient spirit. Like many girls her age, Eden loved to dance. That’s why when she awoke one day with a throbbing pain in her leg, her parents assumed it was just a dance injury. But the pain worsened, and an MRI revealed something much more ominous than a dance injury. There was a tumor on Eden’s tibia, her shinbone. It turned out to be a cancer so unusual that it didn’t even have a name, much less an established treatment protocol, and there was no information about it in the medical literature. It actually appeared to be multiple cancers, specifically neuroblastoma and sarcoma. Thankfully, Eden was in the right hospital. With 140 physicians and scientists and 42 research laboratories, Texas Children’s Cancer and Hematology Center is the largest in the U.S.
Eden’s situation was quickly growing more critical. Her cancer was spreading rapidly, and there was no time to lose. 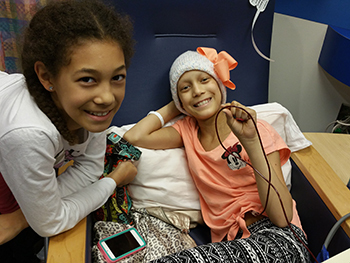 Eden with her sister, Mya, during treatment at Texas Children's. Eden was in extreme pain. She was producing toxic amounts of calcium, putting her at risk for coma and seizures. Her potassium and electrolytes were dangerously low, and she was running a constant fever. Her cancer was so aggressive that her medical team made the bold decision to start her on 14 rounds of intensive chemotherapy and six weeks of radiation. “We couldn’t wait anymore,” says Shannon. 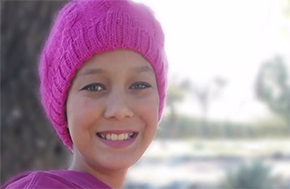 One tumor in Eden’s right shoulder had grown so large that it actually broke her bone. Cancerous tumors and lesions had now spread throughout her body. In February of 2016, Eden finished her treatment. She has follow-up scans every three months and recently underwent surgery to stabilize her hip, where the cancer and chemotherapy destroyed the bone. She is also physical therapy twice a week to regain the strength she lost during treatment. “She didn’t jump or dance for almost two years,” says Shannon. But now she is facing life with the same unconquerable spirit with which she faced cancer! She plays basketball with her friends and is excited to be active in her church again. She wants to get back to dance and pursue her passions for theater and photography. 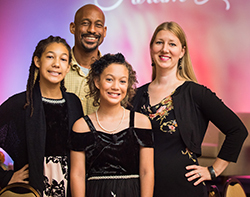 Now 12 years old, Eden is interested in becoming a nurse when she grows up, so she can care for others the same way the amazing nursing team at Texas Children’s cared for her.